After my getaway to the cold New York it was about time to return to the tropics. But this time to one of my favorite places on earth: Tulum, Quintana Roo in Mexico! It has been such a long time since I haven’t been back to this area. My first visit to Tulum was in 2008 (more than 10 years ago) and this was a completely virgin area with almost no hotel options at the time. Not kidding!! My last visit was 4 years ago when I visit my cousin in Playa del Carmen and went to Tulum for the day since it is only 50 minutes away! However, the Tulum of that time was not what it is today! If you compare Tulum to places like Cancun and Playa del Carmen it’s still very virgin since there’s less people and the hotels aren’t as massive like you can see in those places. Tulum has become one of the most popular destination in recent years as it has a magic that can make anyone fall in love. After 10 years this place still feels like my first crush. There’s something about it that will make you realize how special is this place. Let’s start by saying the beach is absolutely stunning! The Caribbean waters from Tulum is just a little taste of what paradise on earth is. Turquoise waters with white soft sand beaches where you can practice excellent diving both on beaches and in caves or caverns. It is surrounded by endless and impressive cenotes that will make you feel more addictive to discover more about this place. You will also find the most impressive Mayan ruins facing the Caribbean waters that it a must place to visit while you are here. Now let’s talk about their atmosphere of this place. You are probably wondering what is so special about this place that everyone is talking about it? well lets put it this way every single place in Tulum is like it was taken out from a Pinterest photo. Everything is designed in such way that it is attractive and photogenic and by this I mean it is super Instagramable with jungle-ish, boho, hippie vibes. Everyone in town are riding colorful bikes, or walking barefoot with their pretty boho chic outfits. You can see people from all around the world falling in love in this little place. Not to mention that also offers great cafes, restaurants (even vegan friendly), hotels in the middle of the jungle. The food situation here is amazing you will find plenty of options that adjust to your budget and the good thing is that everything is so delicious and fresh. I decided to visit Tulum for 3 weeks because I wanted to take a full time experience this time. My first week I stayed in the hotel zone one of the best areas, near the best restaurants, hotels, bars and parties. My house during that first week were 2 sister properties located in front of the sea in the KM9: Zorba Tulum and Mahayana Tulum. 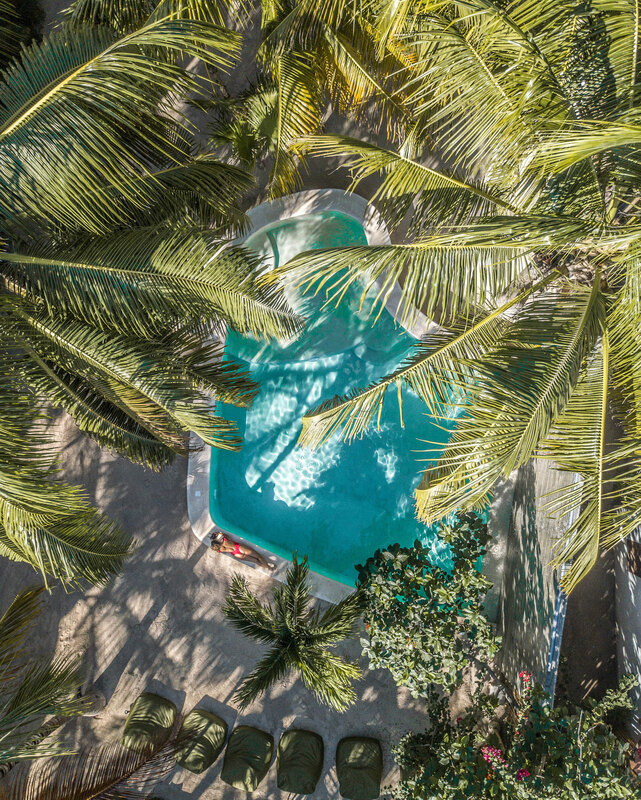 Both properties are luxury boutique house rentals facing the beach that offers common areas like a hotel will do: beautiful pools, gardens, chilling areas and hammocks. Each villa/ house is equipped with its own kitchen, towels, linens and beach towels. They even offer daily cleaning. Both are good options to go as a couple, family, or friends since they provide different types of houses in size that fit your needs. Zorba Tulum is their new addition as it is in fact one of its newest properties. I had the opportunity to stay in their beautiful penthouse with two rooms and own bathrooms where you can fit a total of 6 people sleeping. The main room has a king size bed and a private bathroom. The second bedroom has a queen size bed and two single beds with a private bathroom. Both rooms are connected with a balcony that overlooks the common pool of the property. The design of Zorba Tulum is quite modern without losing the essence of a beach villa. What I loved about this property is the design as the entire penthouse has a lot of glass windows and doors around to let the natural light and breeze come during the day. 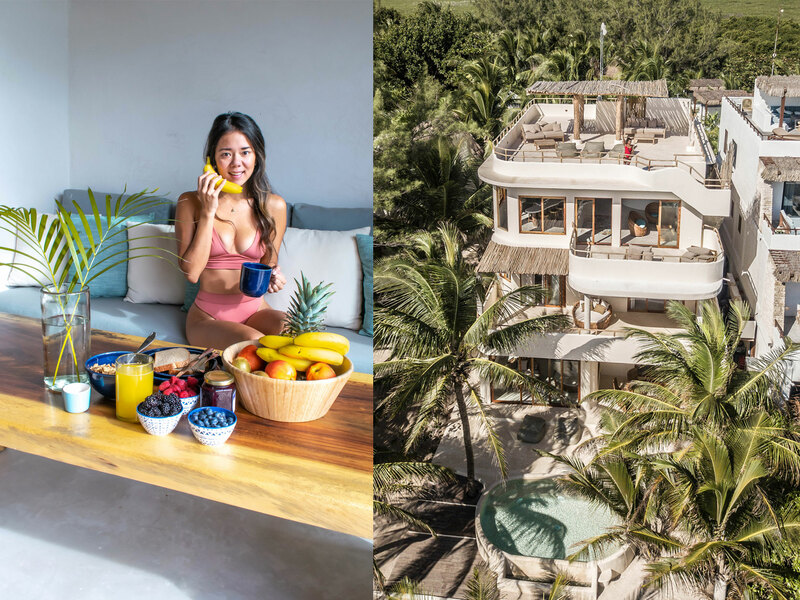 The balcony and the kitchen have a big sliding glass door that connects to a balcony facing the turquoise sea of ​​Tulum Beach to enjoy the spectacular views. I loved the natural elements and the artistic touches throughout the house that give the house a lot of harmony and relaxation. My favorite part of this house is that is accessed by a private entrance through an exterior staircase that connects to the rooftop where you can find a beautiful outdoor living room to watch the sunsets or sunrises. I stayed at Casa Gaia at the Mahayana Tulum: one of the most cozy and romantic houses in which I have stayed. Unlike Zorba, Mahayana’s design is more rustic, authentic, giving its guests more privacy than usual. 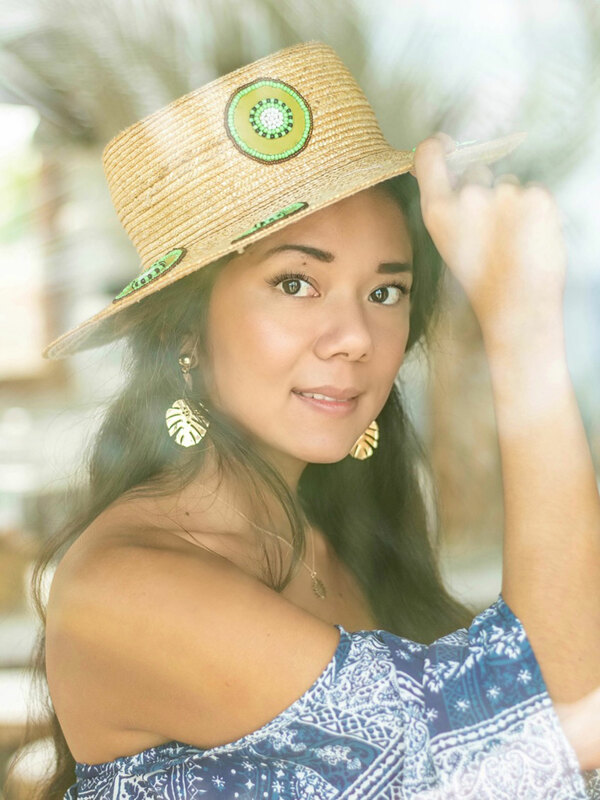 With around 200 square meters case Casa Gaia has a rustic design of vaulted palapa roof and artistic accents of exposed beam and post materials that give it a more cozy and intimate atmosphere like an authentic beach house in the middle of the tropical jungle. Casa Gaia has a nice and big seating area and kitchen which are at the front of the house. These connect with glass doors that open into the sea with a small balcony to enjoy the beautiful sunrises. Casa Gaia is a great option for those solo travelers or couples. It offers a king bed room, private bathroom and a walking closet. 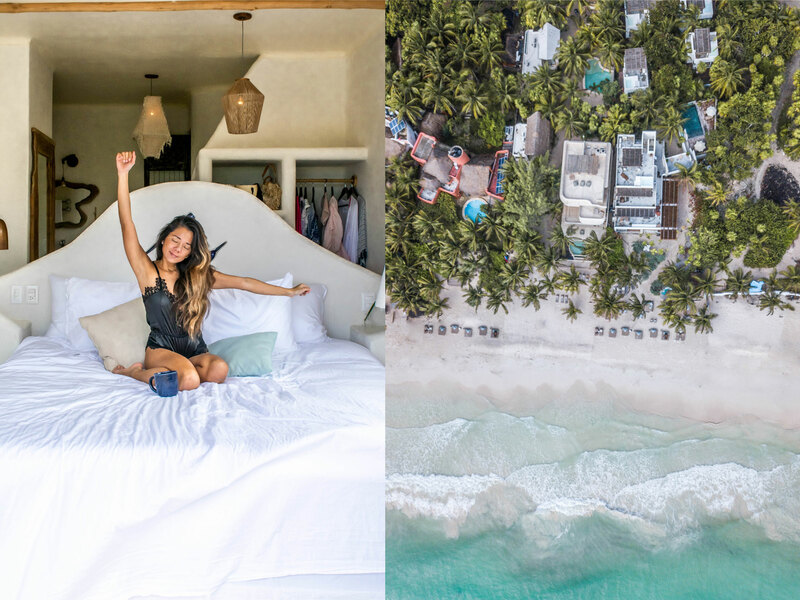 I really could not imagine a better way to start my adventure in Tulum since both properties were at super short distances (literally steps away) from the places I wanted to visit. The location of both properties is really great and I think it is a great option for those people looking to stay in the hotel zone facing the sea. I really liked my rental house experience also because I felt it was more private, there were not many crowds so for that aspect I felt more relaxed even though I was visiting in peek season. And finally I really liked the fact of cooking my meals since somehow this made me feel in my own home and was able to practice my cooking skills. 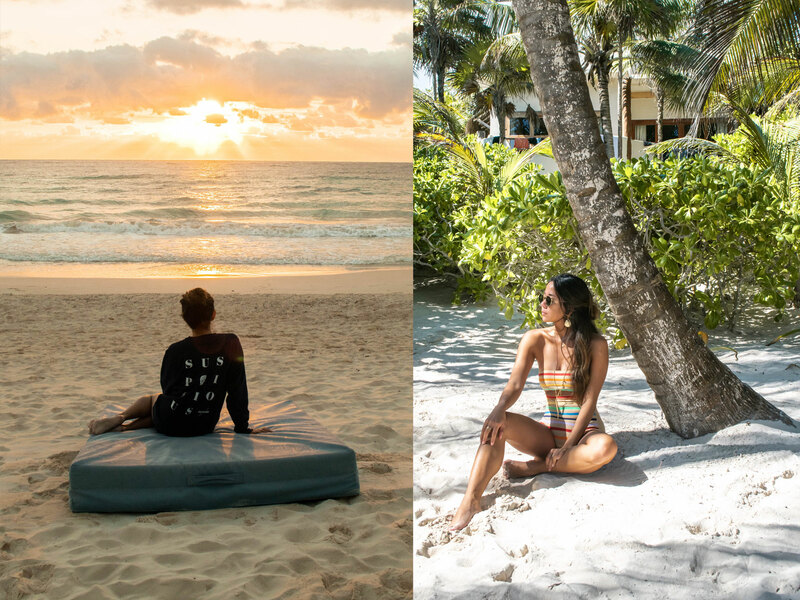 For a complete guide of Tulum click here. I want to thank Snow and Chabely for their hospitality and hospitality to receive during my stay at both properties.